Getting back to the review. These remind me of Flamin’ Crunchy Cheetos or any one of several similar snacks. Trader Joe puts plenty of heat onto the snack. If you like that kind of heat and like snacks, you’ll no doubt like these. And like mine, your rather large bag of this snack will empty out just as fast as those smaller bags from the vending machines. Enough said. 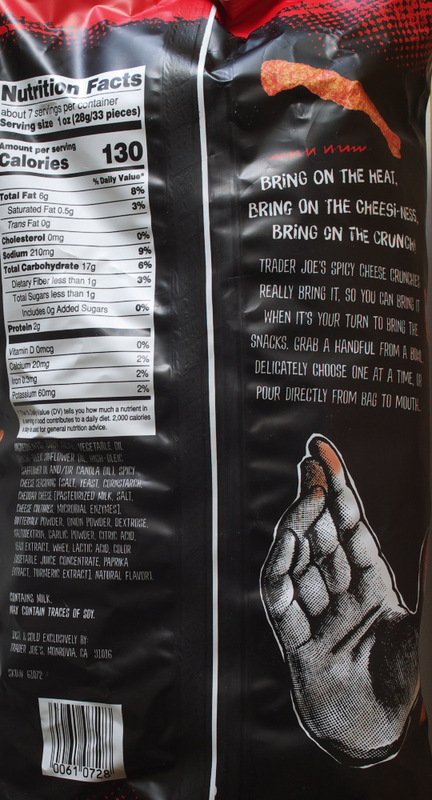 This entry was posted on 06/19/2018 at 08:01 and is filed under Recipes, food, cooking and related items, Trader Joe's. You can follow any responses to this entry through the RSS 2.0 feed. You can leave a response, or trackback from your own site.